Looking at most visual works of art is a public experience. A book is private. Most paintings on the wall are looked at standing; head raised level with the horizon. Everything you see on the wall or gallery floor is read in relation to the horizon and surrounding physical space. Reading a book is an inward looking process. If it’s any good you no longer see beyond the page. Unless you’re sitting on your parent’s knee and being read out aloud to, you are on your own with the author. Sometimes I make books because I want to hold your attention for a longer stretch of time than I could expect to do with my paintings. I use this environment to do something different and engage you with a series of images. I write a script to hold your attention and to persuade you to consider my images in a particular order. I can present graphic images alongside the images conjured by words. All this can be done to great effect with film and other new media but the increasingly historical medium of the book still holds a special fascination. You touch the work. Tuning the pages makes a sound. You can even smell it. You decide when to continue following the linear narrative and the speed at which you unravel it. You can pick it up and put it away again and again, a pocket world. Christmas Eve. The boy was 16 and not quite yet the man he wanted to be. He had a strong urge to leave the home. It was piss up night, the night for going out with your mates and jostling with the crowd, feel beer spill down your shirt sleeve and eye up girls in short skirts and tight t-shirts, their eyelids heavy with mascara. The parents would have none of it. What did he want there? This was a family evening. “It’s a long way. You’re under age. It’s dangerous. How will you get there? I’m not taking you. There are lots of idiots out on the road at night.” He imagined hitch hiking the 20 miles. At home Christmas Eve was the holy of holies, his mother’s moment of supreme power. This was when he had to resist the urge to strangle his sister. He resigned himself to a frigid family evening and the dream of freedom: a young woman’s firm breasts, the girl he would so like to call his own but daren’t touch, the smell of beer, spliffs and patchouli in the fog of the pub, carried along on a wave of thrash metal. He nurtured this image in his mind to combat the wall of cinnamon biscuits, Christmas carols and his father’s mounting bad temper. His mother prevailed with her insistence on peace and goodwill on earth. His younger sister was the excuse for preserving an illusion nobody believed in anymore. He didn’t like to admit it to himself but our adolescent boy was divided, not being as independent as he would like to have been. He was torn between his desire to break out and the comfort of the living room fire, the prospect of a stocking filled with presents, parental love, even the magic of the decorated tree. It was more comfortable to sulk and blame his lack of independence on everybody else. Brightly shone the stars that night, deep and crisp and even. DO THE RIGHT THING — I’m in my aunt’s kitchen. Adolph Hitler is sitting at the long worktop with his back to me and chatting with whoever chooses to spare him the time of day. I feel his malicious presence. At the same time he seems to be part of the inventory, as if he’s always been there. I know my guardian angel is watching. There is no doubt; the man in front of me is seriously evil. I could do the world a favour. I imagine cutting his throat with my new pen- knife. I am amazed how passive he is. Scanning the room for weapons to knock him down with, I can’t find the marble rolling pin I’d like and settle for a stone- ware bowl. Even though I’m standing directly behind him, he doesn’t seem bothered and continues chatting with my omnipresent grandmother. Every time I prepare to whack him, a force prevents me, as if he’s surrounded by a protective aura. I really want to knock him down and I can’t. A cautious relief gradually displaces my paralysing frustration. What if the man in the kitchen isn’t Hitler? I haven’t seen his face. consisting of 7 chapters, each 12 pages long. Text/image pages are interleaved with semitransparent pages carrying watermarks. The underlying narrative describes the anatomy of a family. This is interwoven with associated themes which deal with virtue, vice and the passage of time. 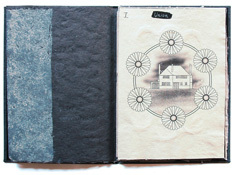 Handmade paper with water-marks, offset lithography, hand colouring and relief printing techniques. Co-published by Fritz Best & John Gerard in an edition of 35 in 2010.
embossed linen binding in a slipcase. All text and images by Fritz Best. is made up of 8 sections, consisting of a black sheet joined to a white sheet by a neutral sheet. Each section treats a pair of opposites and their fragile interrelation-ships. Handmade paper, offset lithography and relief printing techniques. 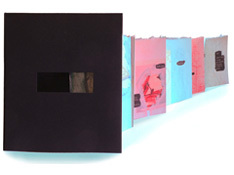 Co-published by Fritz Best & John Gerard in an edition of 20 in 2003.
pages, linen bound. All text and images by Fritz Best. 7 alternating pink and blue double pages. Each tableau has an intermediate state as its theme. Being bound as a leperollo it is in itself something between a book and an object. Multi-layered handmade paper, lithographic, intaglio and relief printing techniques. 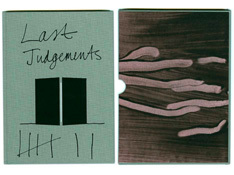 Co-published by Fritz Best & John Gerard in an edition of 20 in 1998.
linen bound leporello. All text and images by Fritz Best. Two graphic novellas contained in one volume and based on short stories by Oscar Heym. Printed by Licht und Tiefe Berlin and Saalpresse Bergsdorf. Edition 100 + 30 Artists’ proofs. Edition Mariannenpresse, Berlin 2000. 24.5 X 17.5cm ǀ 32 pages, embossed hardback cover. Text by Oscar Heym, graphics by Fritz Best.